We love all of our teas, however, Lapsang Souchong is a favourite at Shanti Tea. For anyone who enjoys smoky flavour, this tea is certainly for you. If you don’t like drinking your smoky flavour, that’s okay. We love using this tea as an ingredient for other things besides tea too. Lapsang Souchong is a type of tea from China. Souchong refers to the grade, it’s a larger leaf found lower on the plant, usually, the top two leaves and bud are the most desirable parts of the plant. To gets its aroma and flavour, tea leaves are smoked over a pine fire. The best way to describe the aroma of Lapsang is campfire. That’s exactly what it smells like. The flavour is a bit more complex. You certainly taste the smoke but also notice that it is actually a light tea with a fruity note and smoky finish that is not overwhelming. Salmon is a popular use for Lapsang Souchong, as smoked salmon is often prepared similarly to how Lapsang Souchong is prepared. The two were almost made for each other! Our recipe uses ingredients often paired with salmon, such as capers, dill, lemon and olives. The recipe comes together easily. It tastes great as your main, or use it to top pieces of baguette (place a piece of salmon on the baguette with a small spoonful of tapenade). Prepare the tea: Infuse Lapsang Souchong and coriander in water for 3-4 minutes. Remove tea and allow the infusion to cool, transfer to refrigerator until ready to use. The infusion should be chilled before adding fish. Note: Feel free to reserve the tea leaves to serve on top of fish or in as a side salad. Mix lemon juice and Lapsang infusion. 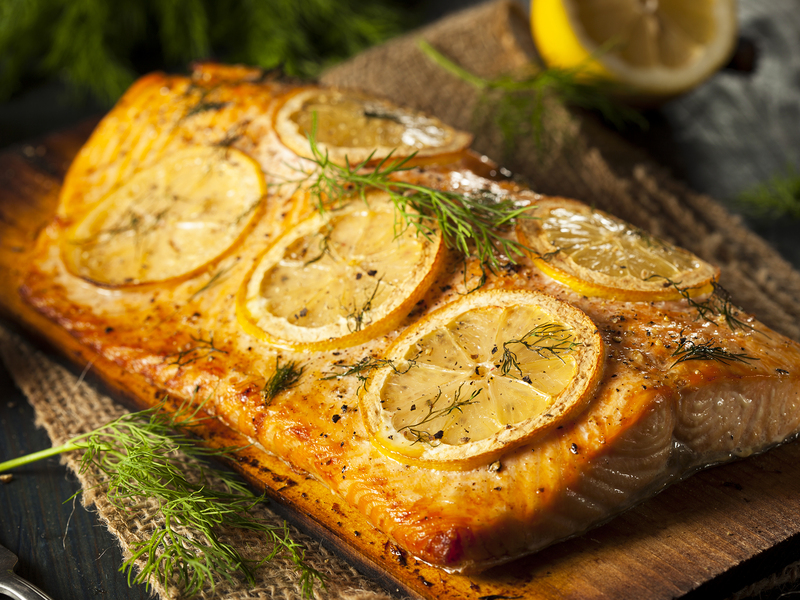 Place salmon in a dish and cover with lemon and Lapsang. Refrigerate for 20-30 minutes. Prepare the tapenade: In a food processor, throw in olives, olive oil, capers, garlic, dill and walnuts. Pulse gently to get even sized particles, about 2-3 mm pieces. Or, just chop the ingredients to about that size. Mix in ½ tsp of lemon zest and dill. Taste the tapenade, add salt and pepper to taste. Add more dill or lemon zest if desired. Optional: a pinch of red pepper flakes is also nice! Another option: For more lemony flavour, get a second lemon and thinly slice it. Arrange slices over the salmon before cooking. Feel free to also add your reserved Lapsang Souchong from the infusion. Heat up your BBQ or oven to 400°F. Cook fish skin-side down until just opaque, about 15 minutes. To serve, top fish with tapenade. In a mixing bowl, combine all ingredients, except the salmon. Lay a large piece of plastic wrap on a baking dish and sprinkle half of your mixutre cup salt. Place the salmon on the salt, then sprinkle remainder on top. Wrap tightly in plastic, place another baking sheet on top of the wrapped fish, then place something heavy and allow to cure overnight, ideally for 24 hours or more. The longer it cures, the firmer the fish. When ready, rinse the fish in COLD water. Optional, submerge in an ice bath of Lapsang Souchong iced tea for extra smoky flavour. Serve with olive tapenade on bread, bagels, salads, or however else you enjoy cured salmon. Ask us how to use teas to compliment your menu! Tea makes an interesting ingredient and adds unique flavours to any dish. In this recipe, Lapsang Souchong is used to get smooth and smoky flavour without smoking the fish, while adding complexity and unexpected malty & fruity notes. Email info@shantitea.ca for help getting started cooking with tea.